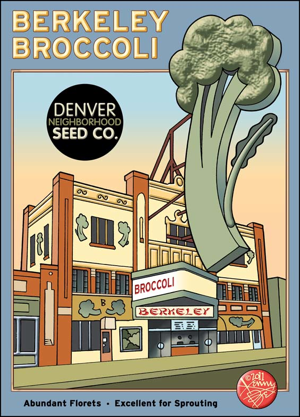 Berkeley is a city-center neighborhood in Denver, Colorado, located in the area traditionally called North Denver, on the west side of Interstate 25. The neighborhood is bounded by Federal Boulevard on the east, Interstate 70 on the north, Sheridan Boulevard on the West and 38th avenue on the south. It is bordered by the West Highland neighborhood on the south and is often casually grouped together with the Highlands. The neighborhood contains two lakes surrounded by parks, one eponymous near 46th Avenue and Sheridan Boulevard and Rocky Mountain Lake Park on Lowell Boulevard and 46th. The Berkeley neighborhood—located on Tennyson Street, between 38th and 44th Avenues—sneaks up on you. From 38th Avenue, one is given little hint of what lays inside the neighborhoods' confines. What you will find, however, is surprising fortitude, cutsie storefronts (though less polished than their prestine counterparts on Old South Pearl and Old South Gaylord), and, to tell you the truth, lots of squirrels. Since Elitch Gardens Amusement Park closed its gates and relocated downtown, some feared that the neighborhood would disintegrate with it, but with that came a lesson: do not underestimate Berkeley. Locally owned restaurants, boutiques and spas, and more art galleries than you can count on both hands, have continued to thrive in their "off-the-beaten-path" location (though it is a mere five miles from downtown Denver). Part of the neighborhood's popularity is due to the Tennyson Street Cultural Association, which hosts a First Friday Art Walk much like the better-known Santa Fe Drive walk, and to the Oriental Theater, a music/comedy/movie venue.